Let the Bible Story Come Alive with This Museum Quality Ancient Greek Coin. The Prophet Isaiah, who lived 700 years before the birth of Jesus, wrote; “Nations will come to your light, and kings to the brightness of your dawn…and all from Sheba will come, bearing gold and incense and proclaiming the praise of the Lord.” Could this have been the Three Wise Men Matthew described in his Gospel? “In the time of King Herod, after Jesus was born in Bethlehem of Judea, wise men from the East came to Jerusalem, asking, “Where is the child who has been born king of the Jews? For we observed his star at its rising, and have come to pay him homage.” Matthew 2:1-2. Biblical scholars have debated the identity of these wise men for centuries. 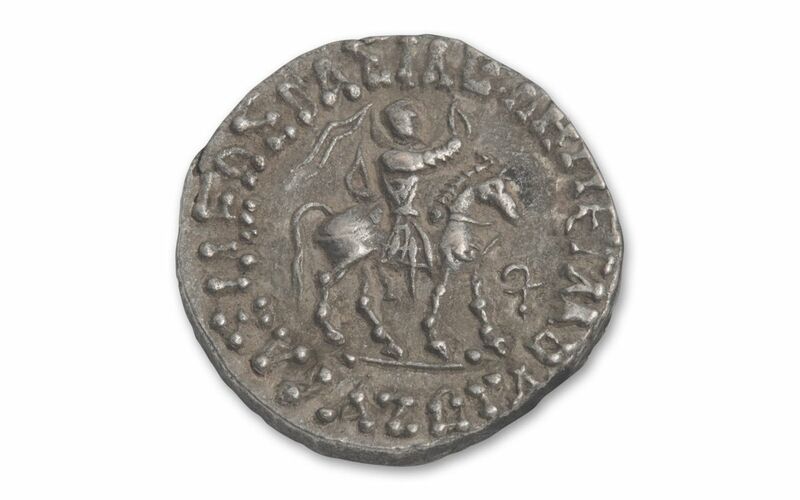 Many believe one of them to have been a representative sent by the “Great King Azes.” Could these Azes Silver Tetradrachm coins have been in the satchels of these travelers from the east? Minted in the Time of Jesus -- Minted from 58 BC up until 5 AD. Tied to Christian History and Biblical Story -- The Three Wise Men traveled from the east orient to Bethlehem and presented gifts to the Christ Child. 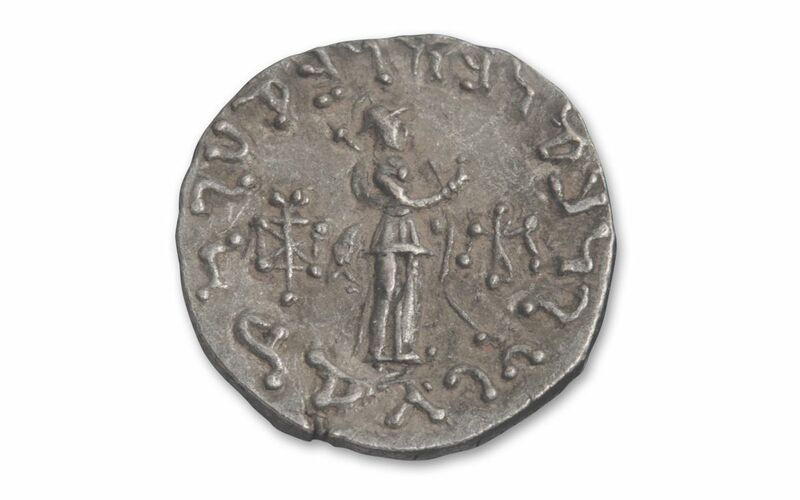 One of the First Bilingual Coins -- Intricately designed with both Greek and Indian language inscriptions. 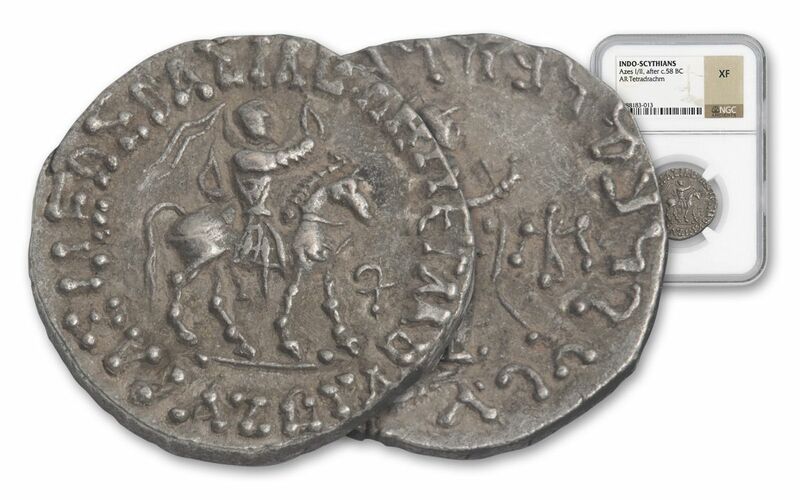 Larger Size -- Coming in at 23 mm diameter, these one drachm coins are larger and more uncommon than other drachm’s. Museum Quality – These are in amazing condition given the fact they are over 2000 years old. Graded and Enclosed in a Story Vault – Graded by the Numismatic Guaranty Corporation (NGC). This coin comes sealed in a colorful clear sealed box with a full color story card featuring an image of the "three kings." These coins feature King Azes on horseback holding a wreath and whip surrounded by the legend that translates from the Greek to, “king of kings, Azes the Great.” The reverse displays a standing figure of Athena holding a shield and a spear or Zeus standing holding spear (scepter). The legend on the reverse is in Indian script and again translates to “king of kings, Azes the Great.” These coins are among the earliest bilingual coins and were hand-struck and considered individual works of ancient art. These are not the small common and poor quality drachm coins of Azes, but rather the scarcer large tetradrachm coins in very high grades. Finding a coin that circulated during the time of Christ is an important numismatic opportunity. These coins are a true tangible link to that important part of history. 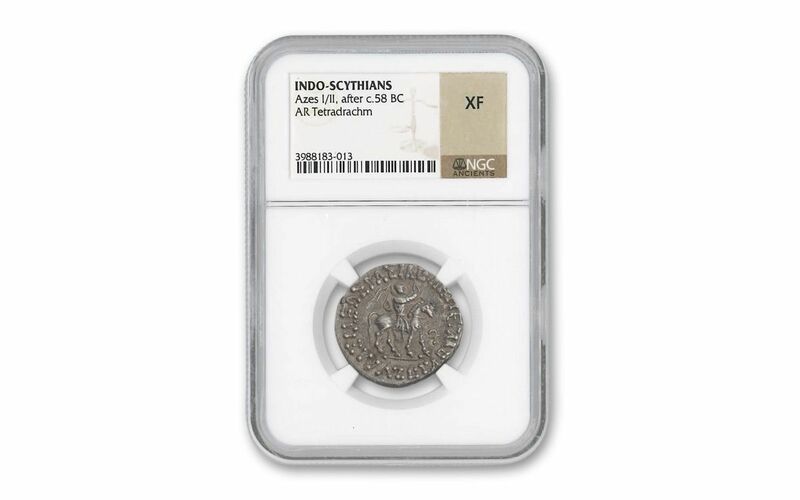 This Azes Silver Tetradrachm is certified and graded in Extra Fine condition by the Numismatic Guaranty Corporation (NGC). This coin comes complete, sealed in a full color story card so you can re-tell the story of the Three Kings to your friends and family and actually hold this link to the time of Jesus in your hand. Order now!